Old hockey heroes and rivalries from bygone days were on display at the Tribute Communities Centre Saturday afternoon. 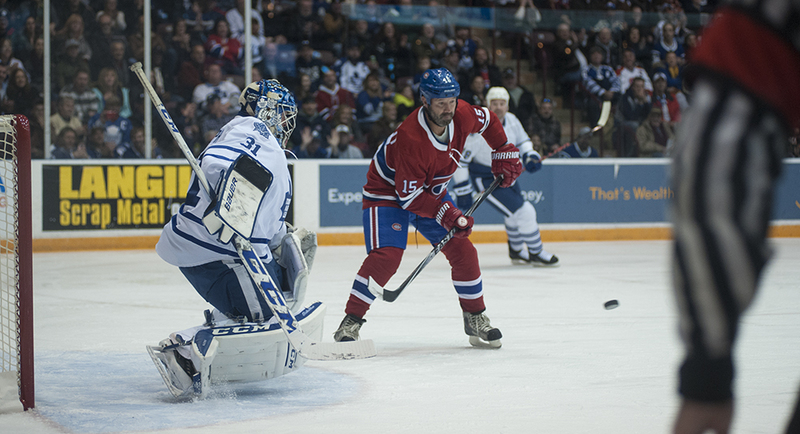 Following a short weather-related delay, alumni players from the Toronto Maple Leafs and Montreal Canadiens laced up their skates and squared off just like in old times. Of course, players like former Leaf captain Rick Vaive and goalie Curtis Joseph move a little slower than they did in their heyday, but it quickly became obvious that their competitive edge had not diminished at all. goalie Curtis Joseph move a little slower than they did in their heyday, but it quickly became obvious that their competitive edge had not diminished at all. In the end the game ended in a 4-4 tie but the real winners were the fans and Alzheimer Society of Durham Region who fundraised at the game.